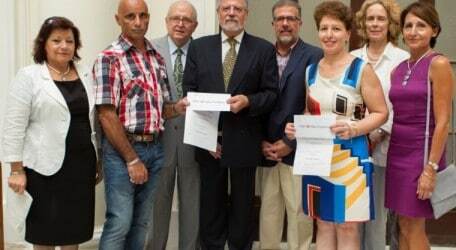 Joint winners of the Malta Lace Competition 2014 Paul Giordmaina and Mary Sultana hold their prize money and certificates in the company of (from left) Margaret Farrugia and Marquis Nicholas De Piro of Casa Rocca Piccola, Louis Borg Manché of the Casino Maltese, Josef Camilleri of HSBC Malta Foundation and Marchioness Frances De Piro and Victoire Borg Manché. The annual event was supported by HSBC Malta Foundation and organised by Casa Rocca Piccola. This year’s exhibition and award ceremony was held at the Casino Maltese.